Human suffering and troubles are the result of human ignorance, said the Dalai Lama during his teaching "Finding Wisdom in the Modern World" at AU Saturday. "All these is negative action due to certain negative emotions," the Dalai Lama said. "These negative emotions, these destructive motions, are basically based on ignorance." The 14th Dalai Lama spoke to a full Bender Arena at 9:30 a.m. He sat on a large beige armchair and spoke enthusiastically to the full arena. A large cloth banner, called a thangka, stretched from ceiling to floor behind the stage, colorfully depicting the Buddha. The teaching began in English, with the Dalai Lama using a translator for occasional words. Toward the middle of the speech, the translator played a larger role. "As a human being, the number one commitment is promoting human values in order to be a happier human being, happier family, happier community," the Dalai Lama said. Religious harmony comes about by accepting all religions, he said. He defined secular not as a rejection of religion, but as respecting all traditions, religions and nonbelievers. The Dalai Lama said sometimes his Muslim and Christian friends disapprove of the word secular. "Sometimes they suggest to me I should not use the word secularism, but I prefer to use it continuously," he said. "Sometimes when I give some teaching, perhaps a bit long, there is people being asleep, then this sneeze is useful in waking them from sleep," he said. There are two main questions in Buddhism, the Dalai Lama said, what is self, and does that self have a beginning and end? Many non-Buddhist traditions believe in souls, something that will last after this life and is outside this body, he said. But Buddhists do not believe in a soul and a self that is permanent, unitary or independent, as non-Buddhist traditions do, he said. "That's what it says if one focuses too much on the continuity of the self, there is danger of focusing on the permanence of the self," explained the translator. As the translator interpreted his remarks, the Dalai Lama put on a red visor. The crowd chuckled. "What do you think, this goes with this?" asked the Dalai Lama. "I don't care. It's something practical, something useful." The notion of self-sufficiency and self-governance is false, he continued. It grasps at the notion of self and is a form of distortion. In Buddhism, that kind of self is a form of ignorance, he said. "So the Buddhist concept is selflessness or no self," he said. Buddhists also believe in a self that is impermanent and constantly changing. Everything is changing on a moment-to-moment basis, the translator explained. These changes and continuity, and whether or not there is a beginning to the self, are the beginning of consciousness and the notion of self. "So the Buddhist answer: no beginning, no end," the Dalai Lama said. Non-Buddhist traditions often emphasize God as infinite love, he said. Like traditions that have a creator figure, Buddhism also aims to reduce self-centeredness, but through a different approach. "Those religious without emphasis on a creator is on action," the Dalai Lama said. "Any action which brings happiness or joyfulness to other, that action produces positive consequences for yourself. Any action that brings pain or trouble on other, the consequences negative you have to face." Many of Buddha's teachings appear contradictory, the Dalai Lama continued. Maybe one day he taught something, then forgot it and taught something else the next day, he said. Or maybe the Buddha was sometimes drunk, he said. Maybe he was trying to confuse his followers, he continued. One philosophical view is not sufficient, he explained. To some people, a certain view is more useful, while to others a different view is more useful. One religious tradition in a world of six billion people is not enough, he said. "That's why we need acceptance of religions," the Dalai Lama said. 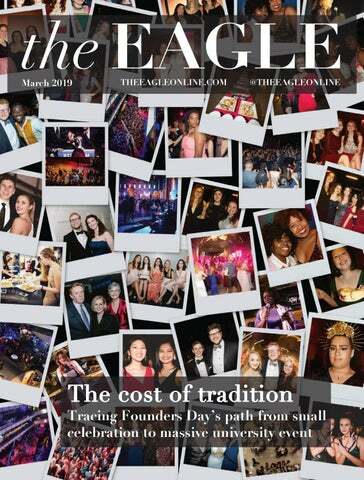 You can reach this staff writer at landerson@theeagleonline.com.